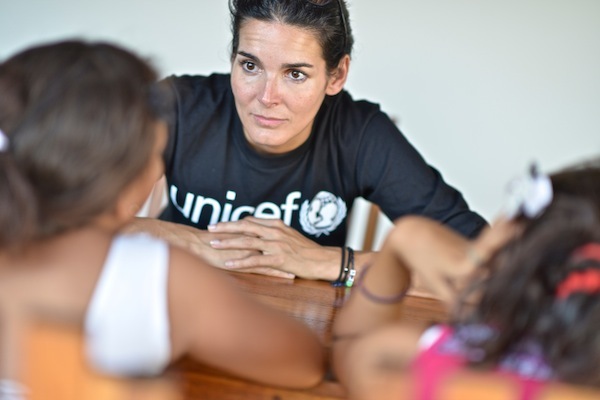 UNICEF Ambassador Angie Harmon is a passionate spokesperson for UNICEF USA's End Trafficking Project. She traveled last week to Nicaragua where UNICEF is fighting to protect children from sexual exploitation and keep them out of the hands of traffickers. UNICEF USA interviewed Ms. Harmon about her visit and UNICEF's work to prevent child trafficking in Nicaragua. Was this your first visit to Nicaragua? What were your impressions of the country? Angie Harmon: Yes, and my impressions are — wow, a beautiful place with incredible people. We traveled all over, Managua, the capital; Bluefields on the Caribbean coast, San Lucas in the north, near the border with Honduras. I encountered the most giving, compassionate people. I was struck by the sheer numbers of young people; nearly half the population is under 23. Harmon: Poverty, of course, is always a key. In Mangagua, I saw kids made to work in the street for money. I saw women in Bluefields scouring through landfills, sifting through garbage trying to find food and things to sell. Half of all children in rural areas are poor, often very poor. And you've also got a lack of education and lack of access to information. The country has two borders — children can be transited easily — and a lot of tourists, some of whom sexually exploit children. These factors combine to make many children and teens vulnerable to the promise of traffickers. Girls are recruited in rural areas to work in urban areas. Then they're forced into prostitution. Tell me about the children you met. Harmon: I met adolescents who lived through some of the most horrific circumstances imaginable, including two 11-year-old girls who had been sexually exploited. But I didn't see victims, I saw survivors. I was awed by their strength and desire to help not only themselves, but also their peers. What is UNICEF doing to protect Nicaraguan children? Harmon: A lot. UNICEF is training teachers and adolescents and church leaders to raise awareness and create protective environments for kids. UNICEF is also helping Nicaragua get better statistics on the problem and develop a real time monitoring system to respond to commercial and sexual exploitation. And really, everything UNICEF does to improve children's lives makes children and families less susceptible to traffickers. Harmon: Inspired. Empowered. Energized. It was amazing to watch these Nicaraguan teens taking the lead, mentoring their peers, showing true leadership. We're making real progress, in Nicaragua and elsewhere, but we've got to keep fighting.